yesterday at Garrison Savannah in Bridgetown. this season but a large collection of solid locals plus ‘David’ and Cavaiachi, who had raced at Woodbine last year. bro John Brian, who has been a tough runner in Barbados for several years. Dancin David was trained by none other than ROGER ATTFIELD at Woodbine but it took a drop to $40,000 claiming to get the colt to win his maiden last August. (Meanwhile, another sibling, STARSHIP FREEDOM, finished 2nd in a maiden grass race at Gulfstream yesterday, for $30,000 claiming). ‘David’ did not race again until last month in Barbados for top trainer Elizabeth Deane and, under Patrick Husbands, the 5yo was a bit rusty and was unplaced. Husbands elected to ride Show Me the Money in the Gold Cup yesterday (that horse won the race last year before he was disqualified) but they wound up 5th. 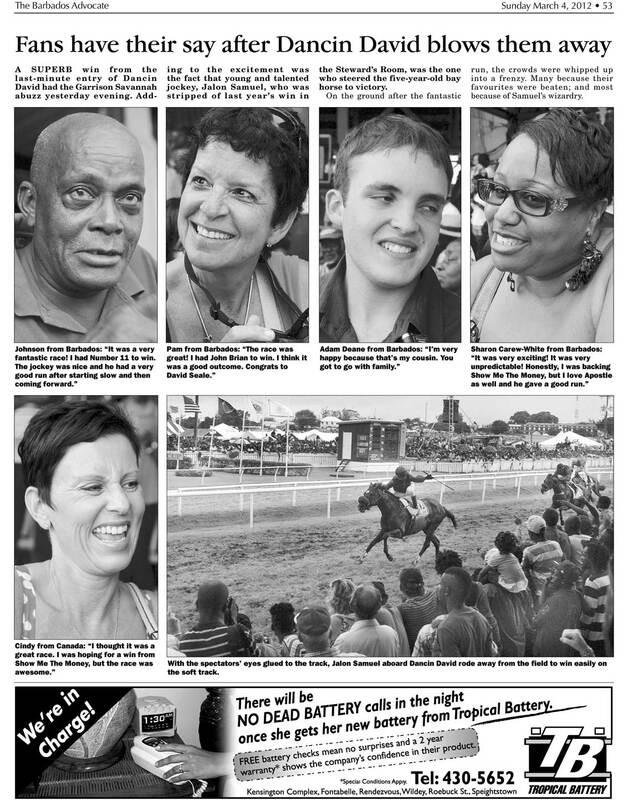 Trainer Deane, winner of some 400+ races in Barbados explains the bittersweet 1-2 finish in a story from the Nation News below (she lost a favourite earlier in the day). Page out of Barbados Advocate! A 19-year wait came to a thrilling end yesterday for Sir David Seale and his connections with a stunning upset and a one-two finish to win the 31st Sandy Lane Barbados Gold Cup at the Garrison Savannah. ahead of last year’s winner Zoom who was ridden by Antonio Bishop. It was the sixth Cup for Sir David following wins with Venice “Pappy” Richards in 1986 on Benton and Sandford Prince in 1989, 1991 and 1992. Chou Chou Royale, with Sandie Hawley, was the last victory back in 1993. It might not have happened if Mingun Temple had been able to face the starter, and Samuel received clearance late Friday night to partner Dancin David, the first alternative. “It has been a long time,” Sir David told SUNSPORT yesterday after the race. Samuel was cited by the stewards for an impediment – would have won. “I probably felt better that way because I knew we were coming to win. better company than they have here. FASTESTWHOGETSPAID, bred by the famed Kinghaven Farms in King, Ontario, overcame a slow start and traffic in the stretch to rally inside a clear leader and win the Gazebo Stakes (formerly the Mountain Valley) at Oaklawn Park yesterday. The bay son of Henny Hughes – Talk Back, by Talkin Man was a $15,000 yearling purchase but has blossomed since he won his maiden for that price last year. His win yesterday came at just 6 furlongs but he has won a route race. The colt is the 5th foal of the mare who won the Princess Elizabeth Stakes at Woodbine. 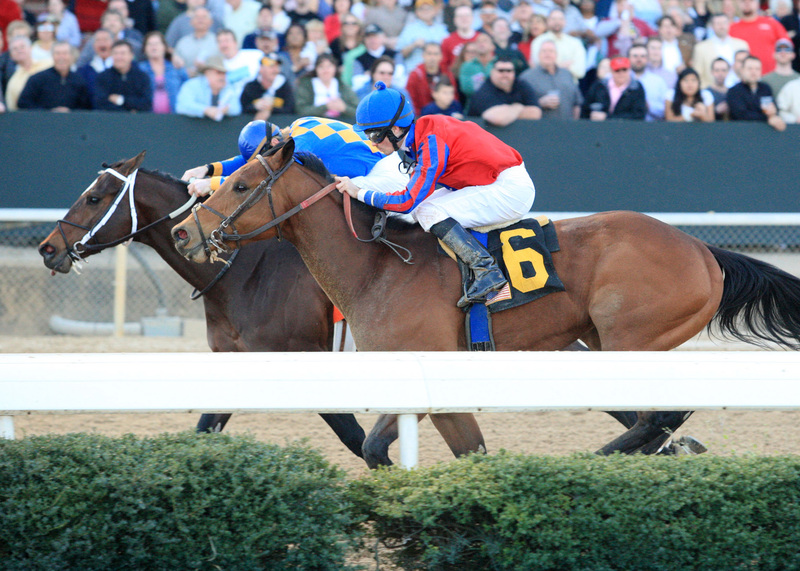 HOT SPRINGS, AR (Saturday, March 3, 2012) – Fastestwhogetspaid was the fastest when it counted and collected the first-place purse money by edging Lake Victor by a nose in Saturday’s $60,000 Gazebo Stakes. It was the first Oaklawn stakes victory for jockey Channing Hill and the second of the meet for Brian Williamson, who also won the Fifth Season Stakes with Color Me Blue on opening day. Fastestwhogotpaid broke slowly from post six, but moved up to race in the middle of the nine-horse field as Brown Eyed Jozi lead the field through opening fractions of 22 3/5 and 46 3/5 for the first half mile. The winner encountered traffic problems coming out of the turn and had to bide his time behind horses until he found an opening then surged late to nip Lake Victor in the final jump. Mr. Bluegrass Music also encountered traffic problems and finished third, while the 3-2 favorite, Exfactor, was never a factor and finished seventh. Winning time for the six furlongs was 1:11 3/5 over a fast track. The 3-year-old Henny Hughes colt, who returned $79 to win as the longest shot on the board, improved his career record to 6-3-1-0 and has now earned $72,310 for owners Oak Knoll Farm and Team Wilcox. 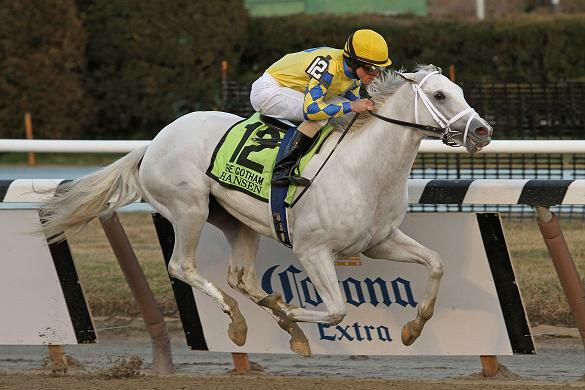 He will now be considered for either the $75,000 Bachelor Stakes at Oaklawn April 7 or the $500,000 Illinois Derby (G3) at Hawthorne Racecourse in Chicago the same day. MARK FROSTAD TRAINEE IS TRENDING! TREND, a Kentucky bred homebred for Stone Farm, ran the race of his life yesterday in the Grade 3 Canadian Turf Handicap and just lost by 3/4 of length to Doubles Partner. Raced and trained at Woodbine by Mark Frostad, TREND posted a 96 beyer Figure, the best of his career. He had won his maiden last Sept. at Woodbine after a start and stop career that began in 2009. He was coming off a first allowance class win. Paco Lopez rode, his 8th rider in 13 career starts. The son of Ontario sire SLIGO BAY (Ire) also has a lovely Canadian female family. His mum is MY CHANEL, a 1-for 18 mare by Canadian sire GILDED TIME out of Canadian bred stakes winner VID KID. TREND looks like an exciting prospect for 1 mile grass races this year, look for him at Keeneland and then hopefully back at Woodbine. back to form with a solid win in the Gotham Stakes at Aqueduct yesterday, despite a very tough, wide trip. His Beyer Figure was 95, a usual number for him. Mark Casse trainee STEALCASE was 6th beaten 10 lengths with a 76 Beyer Figure. Earlier Delightful Mary was well ebaten in the Top Flight (Grade 2) to tough gal It’s Tricky. Another Casse 3yo, DYNAMICAL, is a maiden but ran well in the Battaglia Memorial Stakes at Turfway to be 3rd to STATE OF PLAY. The winner ran an 83 Beyer Figure. Oh, and his jockey even wears different silks than what was available a couple of years back when RON THE GREEK was in New Orleans winning the Lecomte Stakes. The Florida bred by Full Mandate was the best closer in the Santa Anita Handicap yesterday after favourite ULTIMATE EAGLE went silly fractions with GLADDING for 10 furlongs – 22 1/5, 44 2/5? That is bizarre to say the least. Meanwhile, Ron the Greek mowed them down for a trio of owners who recently changed trainers to BILL MOTT. March 3, 2012, 9:06 p.m. Apparently, it takes a village for a lot of things. Case in point: the 75th running of the Santa Anita Handicap, won by Ron The Greek on Saturday. This 5-year-old, with 16 lifetime starts before going to the gate in Santa Anita’s prestigious $750,000 test, was on his fourth trainer and his ninth jockey. He is also jointly owned by three people. His most recent trainer is veteran Bill Mott, the man who trained Cigar to world fame. Mott trains mostly in the East and in Florida and, in keeping with the team approach, sent assistant trainer Rudolf Basset to handle things when they flew the horse in Wednesday. Riding him was Jose Lezcano, also racing in Florida and the East. Lezcano had been aboard Ron The Greek twice before as his trainers played musical jockeys with his career. His breeder and one of his three owners is Jack Hammer of Miami Beach. (Yes, that’s his real name).The other owners are Adam Wachtel of Briarcliff Manor, N.Y., and Nils Brous of New York City. None of the three had won a Grade I race. I would love to have a copy of the text of this video, as we are working to support slots and gaming in Maryland for the benefit of the equine industry.